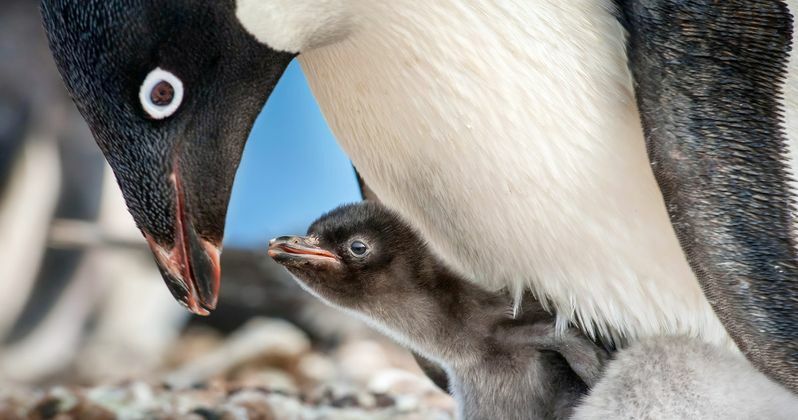 As Disneynature celebrates 10 years since its first feature-film debut, its newest conservation intitiative-this one tied to the upcoming big-screen adventure Penguins was revealed today. For every ticket sold opening week (April 17-23, 2019), Disneynature will make a donation to the Wildlife Conservation Network (WCN) to help protect penguins across the southern hemisphere. Founded in 2002, WCN invests in a select network of on-the-ground conservationists, including top experts in the field of penguins like the Global Penguin Society (GPS). The worldwide leader in science-based penguin conservation, GPS champions specific programs that align with Disneynature's conservation mission. "For example, one of our aims is to track different species of penguins' movements across four continents in the southern seas," said GPS founder and president Dr. Pablo Borboroglu. Penguins swim thousands of kilometers to migrate and look for food. What they encounter during their journeys determines their survival, affects the viability of their species and informs science and conservation action. We are also dedicated to cleaning plastics from the beaches, breeding areas and seas impacting penguin populations. Campaigns to clean up beaches around penguin colonies along selected coastal sectors will help secure a healthy and safe habitat for penguins." "Disneynature has an amazing platform," said Charles Knowles, president and co-founder of WCN. "They're able to reach a global audience in a way that we can hardly fathom. They are uniquely positioned to tell the real story of penguins and the challenges they face. By teaming up with Disneynature-which is so strongly aligned with our own mission-we are able to uniquely communicate about the species we care so much about." "Antarctica is one of the few areas in the world that most people will never have an opportunity to see firsthand," said Roy Conli, one of the producers of Penguins. "It's one of the most remote and harshest environments on Earth-but its stark beauty is breathtaking. Cultivating an understanding and appreciation of the area, the surrounding oceans and the animals who live there is essential to the future of our planet. That's one of the reasons I love sharing the story of Steve-a penguin who's working so hard to thrive in this world, and doing his part for the next generation." To capture the stunning footage for Penguins, a team of the best polar experts in the world traveled to four different locations over the course of three years for a total of nearly 900 camera days. Temperatures dropped below -40 degrees on several occasions and winds twice topped 150 mph while filmmakers were on location. Their efforts resulted in the extraordinary story of Steve who promises to charm audiences worldwide. "It's so fun to watch Steve compete with all the other penguins to set up his nest and win his mate," said Conli. "It's hard not to relate to this guy." Penguins will be the first-ever Disneynature film released in IMAX®. The film will be digitally re-mastered into the image and sound quality of the IMAX EXPERIENCE® with proprietary IMAX DMR® (Digital Re-Mastering) technology. Disneynature's all-new feature film Penguins is a coming-of-age story about an Adélie penguin named Steve who joins millions of fellow males in the icy Antarctic spring on a quest to build a suitable nest, find a life partner and start a family. None of it comes easily for him, especially considering he's targeted by everything from killer whales to leopard seals, who unapologetically threaten his happily ever after. From the filmmaking team behind "Bears" and "Chimpanzee," Disneynature's "Penguins" opens in theaters nationwide and select IMAX® theatres starting Wednesday, April 17, 2019. Celebrating 10 years since its first U.S. theatrical feature, Earth, Disneynature brings the world's top nature filmmakers together to share a wide variety of wildlife stories on the big screen in order to engage, inspire and educate theatrical audiences everywhere. Walt Disney was a pioneer in wildlife filmmaking, producing 13 True-Life Adventure motion pictures between 1948 and 1960, which earned eight Academy Awards®. All seven of Disneynature's theatrical film releases-Earth, Oceans, African Cats, Chimpanzee, Bears, Monkey Kingdom and Born in China-rank among the top 10 highest overall grossing feature-length nature films to date, with Chimpanzee garnering a record-breaking opening weekend for the genre. Penguins, opening April 17, 2019, is the label's 8th theatrical release. Disneynature's commitment to conservation is a key pillar of the label and the films empower the audience to help make a difference. Through donations tied to opening-week attendance of its films, Disneynature has contributed to a host of conservation initiatives. Disneynature's Bears to Be Released in 2014!